Your contact list doesn’t grow on its own and summer is when we all tend to slow down. 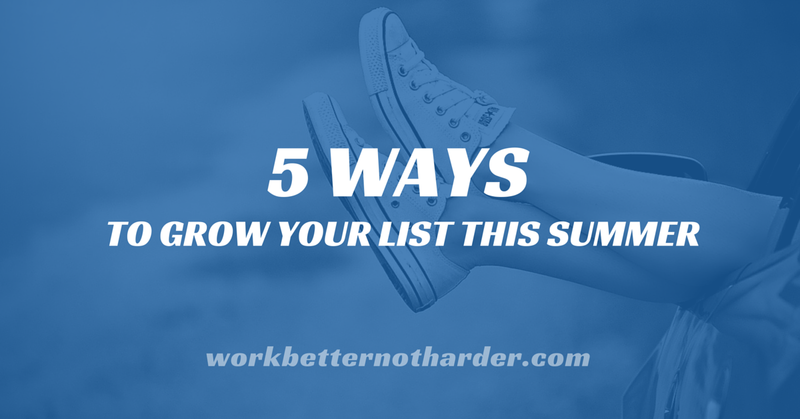 Here are some practical, yet easy ways to grow your contact list over the summer months and still enjoy some time off. When you set up your ‘out of office’ vacation notification, include a call to action and link to your newsletter sign-up form. Set up a series of posts using Hootsuite or similar to encourage sign-ups. You can direct people to your sign-up form, to your archive, or to specific past issues that still make good reading. When you’re preparing for your fall sales activities, also note those that aren’t already receiving your newsletter and encourage them to sign up by sending a personal note. Review not only the contacts in your CRM system, but also those you’ve connected with on LinkedIn, Facebook, etc. You could also consider mailing a copy of your most recent newsletter. The number of networking events tends to drop over the summer and the atmosphere is generally more relaxed. When you meet new people at these events, ask them on the spot if you can sign them up for your newsletter. Your 3 F’s - friends, family and fans – can help get your newsletter out to a larger audience. While you’re relaxing on the beach, remind them that you’d appreciate their help by sharing your newsletter on social media platforms or by email. These are the people that care about you, they are always happy to help! Enjoy a slower work pace over the summer and build your business at the same time. We are trying to grow our list this summer too! Our monthly newsletter is full of ideas and tips for busy business owners. Originally published in the RWN Summer 2013 Newsletter issue.